Welcome to the Winter Issue of the MACLA Magazine. As you might notice, due to a high response from everyone, my welcoming notice has had to be pushed well and truly into a corner. In opening can I, on behalf of MACLA, wish everyone a Merry.Christmas and Happy New Year. I hope you find something of interest in this issue. With several new contributors I personally think we have managed to covered an even wider spectrum of topics including a very poignant poem on page 59. If there are others of you who, in the future, would like to contribute, please do not hesitate in contacting me; various contact methods can be found on page 66. Though there is little if no trace today, almost 900 years ago Nocton, like some one hundred other locations in Lincolnshire, had its own monastery. The founder of Nocton Park Priory was the second lord of Nocton Hall, Robert D'Arcy, who had been heavily influenced by the monastic revival of King Henry 1st. At this time, back in the early years of the twelfth century, Robert, an understanding landlord, had realised the need for "education" and placed the churches of the two villages of Nocton and Dunston into the hands of the Benedictine Monks. He felt this was the best way forward for his "people" as these holy men, in the main, were the only ones able to read and write and thus pass on their knowledge. Around 1118 Robert gifted around 300 acres of his Nocton estate to the Canons of the Order of St Augustine with the Cisterian Monks of Kirkstead the trustees. The Priory erected on what is known locally as Abbey Hill also had a convent built in close proximity but little, if nothing, is known of this. From its location on the hillside the monks had an unobstructed view across the fenland towards other priories situated at Tupholme and Bardney. The Priory was a seat of learning and human activity for over 400 years until Henry 8th launched his attack on England's monasteries on the implementing of the Dissolution of Monasteries Act in 1536. Continue reading The History of the Priory of Nocton Park. As we approach the halfway stage of our season (although most teams have only played a third of their matches) it is time to reflect on our progress so far. Stuart Robinson's very young Senior Saturday side is having a much improved season, being only one victory away from third place in the Lincoln League. Management upheaval and sickness has not helped the Sunday First Team's Premier progression. They have played only a few league games and have already suffered an unexpected dismissal from the County Cup by a lesser Grimsby side. Dave Atkin's Sunday 2nd XI side are currently third in Division Three and having an excellent season. The Under 18s, led expertly by Alan Ward and Andy Blackband, are, in the main, last year's U16s and are taking time to settle at this level. An excellent result in the Charity Cup where they beat Woodhall Spa 9 - 8 on Penalties after being level 2 - 2 at the end of extra time. In the next round they will entertain one of Lincolnshire's better Intermediate sides, Lincoln United, and that will certainly be a stern test of how much they have improved. Unfortunately, we lost two of our junior sides, Under 11s and 13s at the start of the season due to lack of players, always a struggle for village sides. We now have only(!!) six sides competing in the MidLincs league. Barry King's Under 15s are finding playing in the 'A' League a difficult proposition after last season's promotion. Roy Roger's Under 14s continue to impress and are vying for the leadership of their 'B' league. Paul Scigala's Under 12s are in mid table in Division D and are still in the Cup after an impressive victory over Cranwell 'A' from a higher league. John Haresign's Under 10s and Paul Chamber's Under 9s both are currently mid table in their respective leagues and are coming along nicely. Chris Wood's Under 8s play only 'non-competitive' matches. That is to say there is no league table produced, not that the lads and lasses don't get stuck in. It is obviously expensive to run a club with ten teams and luckily for us, Liz Rogers joined our committee at the last AGM, and is responsible for fund raising. So far Liz has, in conjunction with The Mowgli, organised an "Indian Evening" which was well supported, and raised a large amount of money that has been split between the Club and a Mowgli supported School in Bangladesh and has also helped organise and run our Mulled Wine stall at the Fair & Feast, again raising much needed funds. Along with her husband Roy and other enthusiast they won the best decorated Stall with their adaptation of "Oliver". Well done to everyone concerned. Next event will be a Christmas Fair in the Village Hall on Saturday, 5th December. We are also very lucky to be able to call on several local organisations for help and none more so than Maggie and Butch from the Star and Garter Hotel who have always been a great help. As I write this, I have just returned from the cremation of Derek Sampson, ex youth team manager, ex Vice-Chairman, Life Vice President and all round good guy. A gentleman who always had a smile on his face, even when obviously in great pain. He brightened up our Monday evenings (meeting nights) with his array of exotic football shirts, especially a vivid Marseille creation and a 1970s Gunners example and will be sadly missed by his many friends at Metheringham Football Club. As 2010 approaches we are once again preparing for the French visit to Lincolnshire. The dates are set for April 14th - 18th and we are planning an interesting programme. We continue to seek new families so if you are interested please do get in touch with one of the committee. All proceeds towards Blankney Church Tower Repair Fund. The U3A would like to take this opportunity of thanking its committee, the group conveners and all the members who have willingly worked hard in ensuring that 2009 has been a very successful year. During these last 12 months a variety of new groups have been established, and it is envisaged that this trend will continue in 2010. Best wishes to everyone for Christmas and the New Year. In December the main event will be the Christmas Lunch which is taking place at the Bentley Hotel in the Crystal Suite on Tuesday 8th, with an arrival time of 12.30pm for a 1pm start. In the new year the scheduled presentations for the general meetings at the Branston Village Hall will involve Ralph Timms who will talk about 'Margarine' on 26 January, and on 23 February Ian Dewhurst will give an account of 'An Informal History of the 20th Century'. It should be noted that the Armchair Travel Group will not be holding a meeting in December. However, they will return to the Old Village Hall in Heighington on 12 January, when Malcolm Earney will enlighten an avid audience with his knowledge about 'The Canadian Arctic'. To get in the mood for Christmas, the Classic Movie Group will be showing 'The Bishop's Wife' (starring Cary Grant, Loretta Young and David Niven) on 15 December. During January the 'Inn of the Sixth Happiness' (starring Ingrid Bergman and Robert Donat) will be shown, and then 'All About Eve" (starring Bette Davis, Anne Baxter and George Sanders) is lined up for February. During next July there will be a U3A Summer Schools programme at Harlaxton over the periods of 11-14 and 15 -18. These schools offer an attractive range of courses that are held in beautiful surroundings. Anyone wishing to attend must contact Wendy Farquhar-Smith on 01780 756316 as soon as possible. Further information can also be obtained from www.HarlaxtonU3A.co.uk. After our Summer break, during which members enjoyed a cruise and lunch aboard the Nottingham Princess, the club re-opened on 9 September. Nicola Tallent, from the Lincolnshire Lincs, gave a talk to the members on what route to take if they were paying for and receiving poor services. On 23 September, Kathy Lote, from Age Concern came to the club to advise members of all the services available to them. Forms were handed out for members to complete and submit for information packs on whatever they wanted to know more about. Only one meeting was held in October, on 21st, at which the Rev. Les Whitfield conducted a Harvest sermon accompanied by Pam Rix on her keyboard. Les then donned his auctioneer's hat and did an excellent job of selling all the goods to raise money for the club. On the 4 November members tested their knowledge with a bit of fun with antiques shown by Ann Barnes. Then on the 18th held their annual musical afternoon with Ray Pulman and Hugh Wilson. The last meeting of 2009 will be held on 2 December at Pennell's Garden Centre where members will enjoy a Christmas lunch before wandering around the centre to do some Christmas shopping. We re-open on 6 January 2010. We meet every fortnight in the Heighington Jubilee Hall and anyone wishing to join, should contact South Lincs Blind Society on 01476 592775. 'Pirate Treasure' our annual pantomime this year has been written and is directed by Ingrid Burns. This is a typical story of good against evil and will ensure that all the family will be treated to a fun filled time in Metheringham Village Hall. This is our 18th annual pantomime by MAD. To give you an idea of what to expect read below!! Jimlad Golightly acquires a treasure map from Pegleg Pete, and he and his mum Dame Semolina Golightly persuade Squire L'Tawny to finance an expedition to a desert island. They set sail on the good ship 'Sea Slug' with a crew including Long John Pewter. As in all pantomimes there's a fly in the ointment. Villainess Captain Jack Vulture wants her map back. After all, she legitimately stole it from Blackbeard the pirate. She and her crew of pirate girls pursue our hero in her ship 'The Black Oyster'. Everyone is harassed by Minnie Strater the health and safety rat. There are songs and slapstick along the way, and of course 'He's behind you.' Oh no he isn't. Oh yes he is.' They all meet up on the island. So there's bound to be trouble. Will Jimlad win the day? If you cannot make any of those times, we have been invited to perform our production at Sleaford Little Theatre on Saturday 13 February at 2.30pm and 7.30pm. If the pool manages to stay open next year, the cost of swimming, party hire and lessons will have to be increased to pay the ever increasing costs. Gate fees alone are not enough. We need to fund-raise but you are not supporting us. We are not a club. We cannot say to our members:- "Buy a ticket" - "bring a raffle prize". We are a public service and we work very hard to keep a brilliant village amenity open. There are only four of us, with occasional help from a few others - cutting the grass, trimming the hedge etc. The pool belongs to the Parish Council and they help us in many ways but we cannot expect them to increase their share of the council tax. During the past year we have bought a new boiler, fitted new Summer covers, bought new picnic table, our own printer (each photocopy cost us 8p! ), stripped the changing room floors, re-laid some of the patio slabs and decorated, attended training course and meeting. The only thing we don't do is sleep there! Continue reading MADSPA Update Winter 2009. Church Walk Surgery is a spacious purpose built surgery situated on Drury Street in Metheringham where there is ample parking available on site. Our friendly team comprises of Senior Partner Dr Nicholas David, Dr Ivan Wilkinson, Dr Andy Buffy, Nurse Prescriber Sister Julia Mannion, Nurse Judith Foley, Practice Manager Sheena Jamieson, Practice Administrator Brenda Counsell, Phlebotomist/Dispenser Ingrid Burns, Receptionist/Dispensers Beryl Cucksey, and Clare Rowland. The surgery provides a full range of specialised clinics which include; Asthma, Diabetes, Heart Disease, Chronic Lung Disease, Smoking Cessation, Family Planning, Travel Health, Well Person, Ante-natal. Our Nurse Prescriber Sister Julia Mannion can also manage minor ailments. Appointments for Doctors and Nurses may be booked up to one month in advance. Our dedicated reception team will always endeavour to be as helpful as possible and treat all patients as individuals. If you would like to know more about us please feel free to ring or pop in. Scopwick Tiddlers is a parent and toddler group which has been running for over 15 years. We meet every Tuesday during term time from 10-11.30 am. The price of admission is currently £1.50 each week which is for each parent and child; this includes a free drink and a snack. We are currently offering the first session for free and after that there is a one off joining fee of £3.50, followed by £1.50 each week. During the year we run many activities such as Easter party, Halloween party and Christmas party and we also try and include some make and do activities to keep the parents busy!! Each year we run a summer outing which this year was to Sundown Adventure land. Although it rained we all had a good time and it was a great way to finish off the summer term. To raise money for the group the children have just completed a sponsored Welly Walk around Scopwick which was enjoyed by all. Even the babies had their wellies on whilst in their pushchairs!! The group is very friendly and we are always looking for new members, so why not come along and join us. If you need any more information contact Helen on 01526 378982. The Parish Council is progressing negotiations with the land agent to acquire some of the glebe land in the village for use as allotments. As previously stated the land will not be available until December 2010 due to the surrender of the current lease. There is now a waiting list of twenty three people. If anyone knows of any land in the parish that would be suitable for hire or purchase as allotments please contact the Clerk. Following the success of the Christmas Tree Lighting ceremony and carol service last year, the Parish Council has organized a similar event which will take place on Wednesday 2nd December at 7.00pm at the War Memorial Garden, Metheringham. This is a family event so please come along and join in the celebrations. Continue reading Metheringham Parish Council News Winter 2009. As the autumn season draws to a close and with the long dark nights upon us, the committee would once again like to thank all residents for their strong support at the summer events, helping us to raise funds for more improvements to your village hall. During the summer season we held the 50/50 auction, which proved to be as successful as ever, thanks to Mr. John Duggins and his team. On 9 September we were entertained by "Harmony Lincs" on their rehearsal tour which was enjoyed very much by all those who attended the free evening. The Celebration of Art, Craft and Hobbies Day was so successful with villagers displaying a wide variety of their skills, making it an enjoyable day of meeting friends old and new. The interest shown by the many people who visited during the day was excellent. "WELL DONE" and "THANK YOU" to all the exhibitors (too many to mention in this space) and the hard work by the organisers who are hoping to make this an annual event. The New Age Kurling has been a success due to the hard work and dedication of Gwyneth and Peter. Due to other commitments, I have yet to attend, I understand from others that the evenings are full of fun and friendly rivalry. The new season will start in February 2010 for 10 weeks. Details and information are available from Gwyneth on 01526 322633. Don't forget the Christmas Party on Friday 18 December. Doors open at 6pm and it's FREE. Why can't a man living in England be buried in Ireland? Is it legal for a man in John O'Groats to marry his widow's sister? Why? If there are 3 apples and you take way 2, how many do you have? A huge football fan claimed to be able to say the score before any match. How did he do it? You can start a fire if you have alcohol, petrol, paper, candle, coke, a full matchbox and a piece of cotton wool. What is the first thing you light? "Calling All Artists" - Budding or Blooming! We meet each Friday morning, 09:30 - 12.30 at Scopwick Village Hall. This is a group of mixed abilities, so you are welcome regardless of standard. Artists use whatever medium they like;Watercolour, Pastel, Gouache, Coloured Pencil and Acrylic etc. A local professional artist is available most Fridays to offer help and advice if you want it. We have kitchen facilities, but bring our own tea-bags/ coffee/sugar/milk! We have demonstrations by professional artists throughout the year,with six scheduled for 2009/10. The cost for these is just £3.00 per demonstration (these last from 10.00am - 12.00) and offer excellent tips and tricks, whether you are familiar with the medium or are thinking of trying it. We have a group meal once or twice during the year and annual visits to the Art Festival at Patchings - other outings may be planned in the future. We also have a Christmas Party arranged for 18 December next at Scopwick Village Hall. In addition to all of the above, we hold an exhibition and sale of our work over a full weekend each summer. If you have any questions, please contact the Secretary email: : millenniumartgroup@kingfisherblue.net. Are you looking for a way to support your community? Are you interested in becoming a First Responder? Do you have a talent for fundraising? is looking for new volunteers. Our Autumn programme of events and activities has been well received by members, including a Christmas shopping trip to Peterborough on Wednesday 11 November. By the time this edition is published, club members and invited guests will have enjoyed their annual Christmas Dinner in the village hall on Wednesday 2 December. a. Andrew's Butchers on the High Street. b. The Frame Shop on the High Street. c. Karen's Kuts on the High Street. d. D. K. News on the High Street. e. The Great Barrier Reef , fish & chip shop on Princess Margaret Avenue . f. The Metheringham D.I.Y. Shop on Caroline Road . g. Jenny Honisett for the Parish Council on their notice board outside the Post Office. On behalf of the committee and members, thank you all for your help and support. Wed 6 Jan - Ray Jones Slide Show on bee keeping. Hopefully, this will give us a bit of a buzz and stir us to provide the right kind of flowers for bees in the Spring. Just like us, they have had a bit of a recession recently and there has been a huge decrease in bee populations. In our rural economy we, more than others, are keenly aware of how important they are to pollinate crops. Wed 13 Jan - A trip to the pantomime "Jack and the Beanstalk" at Nottingham . We will commence with a shopping trip first followed by attending the matinee performance and return home during the early evening. Take-up has been rapid, there is now a waiting list but if sufficient members and guests are interested we may be able to arrange a bigger bus. Wed 3 Feb - Rock & Jive - a band playing lively old favourites at a reasonable volume. Wed 3 Mar - Annual General Meeting (AGM) with a Fish & Chips supper. Sat 6 Mar - A Coffee Morning will be held in the village hall between 1000-1130 a.m. Open to all, we have a raffle, a bric-a-brac stall including books and a cake stall. Any items for donation kindly accepted. The Band has had a busy summer season, which included playing at the Metheringham Fayre & Feast where the players refused to be daunted by the bad weather and managed to find a warm, dry spot in the Village Hall where they entertained throughout the afternoon. Dunston Scarecrow Festival was a first for the Band, and they entered right into the spirit of the event by playing on both days dressed as scarecrows themselves, much to the delight of the crowds! That was a busy weekend for the Band as on the Friday they had played at a Cheese and Wine event in Nocton where they received a standing ovation for a fabulous performance. The Band will be playing somewhere near you during December - Dunston St Peter's Christmas Tree Festival, Metheringham Methodist Church Carol Service and Branston Parish Church Carol Service, as well as carolling at various locations over the festive period! The Band Christmas Concert will be in Nocton Village Hall this year - it is on Saturday 19 December at 7.15pm. Entry is free and there will be a raffle and bottle draw during the evening. The concert will contain a mixture of seasonal music and Band favourites from the year, and you are invited to join the Band for light refreshments after the performance. The Band is always welcoming of new members; whether you already play a brass instrument or would like to learn, we would love to hear from you. It only costs £15/quarter to join (around £1/week! ), and you will receive tuition if required, the loan of an instrument and music, as well as the opportunity to learn new skills and to become a member of a fantastic local music-making activity. We are a small, friendly group of men and women who are keen to improve their German conversation, and are following a BBC video course entitled "Deutsch Plus" with supporting material. Standards range from basic to intermediate German. We are fortunate to have as one of our members a German lady who has lived some time in the UK, who is able to give us some guidance. We meet on the 2nd and 4th Wednesday of the month at a private house in Dunston from 2.30pm - 4.30pm, with a break for refreshments half way through, and a small charge of 30p is made to cover the cost. special and original this Christmas? Enjoy an oasis of calm in the run up to the festive season by joining us for an hour or two at our magical, pre-Christmas celebrations. The Church will be lavishly decked out and lit by candles and fairy lights. Join us for our Preview evening on Friday 11 December from 7.00 pm - 9.00 pm. Tickets are £5.00, to include a glass of mulled wine, wine or soft drink and canapés. You will have the opportunity to buy gifts, decorations and produce and try your luck with a raffle and giant tombola. The fully dressed Christmas trees will be auctioned and available for collection on Sunday evening or Monday morning. These have been donated and beautifully decorated by various companies and individuals in the area. Lynda and Maurice, who you have seen and heard before, will provide live seasonal songs and music - sing along if you wish! On Saturday 12 December and Sunday 13 December the doors will be open from 10.30 am to 6.00 pm daily. Families can enjoy mulled wine and light refreshments, including mince pies. There is an old wives tale that twelve mince pies made by different cooks should be eaten to give you luck throughout the coming year! Have your first one here. You will also have the chance to buy gifts, decorations and produce, including delicious puddings (to save the ladies some cooking) jam, chutney, Christmas puddings and sloe gin. Try your hand at the Giant Tombola with some wonderful prizes, while the children do a special Christmas Quiz. The climax of the weekend on Sunday 13 December is Carols by Candlelight at 6.00pm with all your favourite carols and festive readings. Feedback from our previous Festival was that the grandchildren found it all absolutely magical! Please do bring a torch. If you would like further information or to buy tickets, please do not hesitate to contact 01526 322284. The environmental board mentioned in an earlier News Letter has now been erected by the beck outside the village hall. This was funded by a grant from the Environmental Agency and shows some of the wildlife that may be seen along the beck - although patience and a little luck may be required to see the water voles and kingfisher ! During the last few months the funding for refurbishment of facilities in the village hall has finally been achieved. The Village Hall Management Committee have pulled together funding from WREN (Waste Recycling Environmental Ltd), a host of fund raising events, and contribution from the Parish Council. Work to re-organise and open up the kitchen and bar area and to completely renew the toilet facilities, as well as lay new floors in those areas, will commence with a local contractor in January. It is planned that all work will be completed by mid March. There will be no appearance of change on the exterior of the hall. While all this work is going on the Management Committee is making every attempt to maintain regular activities by dividing off the work area from the rest of the Hall. Whatever the short term disruption the benefits from this major refurbishment will be appreciated by users for years to come. The Parish Council are in regular contact with Lincolnshire County Council Highway Department to progress local issues. Some planned actions such as the opening up and repair of the damage in Trundle Lane may be delayed during winter months. However, regular bus users will in this season appreciate the additional weather protection installed by the Parish Council to the bus shelter in Heath Road and admire the newly repaired and smoothed path opposite. Also, following suggestion from local people, provision has been made for the rapid repair of any excessive damage to the verges by cars parking outside the village hall. All positive suggestions are welcome. Our 29 new Reception class pupils have now settled into school and are being well supported by Miss Meyerhoff, Mrs Flintham, Mrs Whapshott, Mrs Wray and Mrs Enever. They have visited the local hairdressers and participated in nature walks around the school. Key Stage 1 pupils enjoyed their 'Super Hero' topic which involved creating super heroes, designing costumes, scientifically testing super powers, producing films and writing scripts and stories about the created heroes. Parents visited during the last week of term to watch their children's productions and to share their children's learning achievements. Lower Key Stage 2 pupils have been working on the topic 'Bombs Away' which has looked at World War 2 and has focused on life as a child during the war. Our pupils spent a day at Stibbington as an evacuee. Pupils set off on their visit dressed in war time clothes armed with their gas mask boxes and carrying their brown paper bags of rations for lunch. Upper Key stage 2 pupils have covered the topic 'Wild' which focused on animals and their habitats. Pupils carried out research about different habitats, created a model of a habitat and wrote a diary story about a day in the life of an animal living there. The Harvest assembly took place in school at the beginning of October. Our new Reception parents were invited to attend and all pupils took part in the celebrations.Harvest donations were sent to the New Life Church Community Larder. Expressive Arts week took place in October. A visiting Arts teacher worked with pupils on street dance and all pupils were invited to perform their street dance at the end of the school day. A visiting artist worked with the pupils to help create an 'Enchanted Forest' for our main corridor. Our younger pupils worked together on 'bug' collage work and our older pupils worked on creating 3D models for the display. The forest is now expected to grow over the next few weeks once finishing touches have been made to the art work and models! Metheringham Primary School has once again been successful at the LAFTAs film event in Lincolnshire. Our team of film makers picked up the LAFTA for the best infant fiction film with their production of 'The Ironman and the Train Crash'. We were also the delighted recipients of the Patron's Award, chosen by the actor Jim Broadbent, for the best primary school film entered. Elspeth McMenemie - Head Teacher. FOMS would like to thank everyone who attended the School Summer Fayre in July it was a very successful day and the weather was very kind to us. We will hopefully be planning another one for next year so watch this space! We will also be holding a Christmas Fayre at the School on 3 December from 3.30pm-5.30pm. FOMS will be running some of the stalls. The school children will also be running a number of stalls selling their own hand made crafts. Other stalls include Tombola, Christmas Raffle (tickets on sale in school entrance before and after school until 2 December), Treasure Map - to find Santa's home, Book stall, to name a few. Come along and join in the fun. If you get really stuck, there's a hidden hint in the Editor's Corner of this magazine. Answers in the next edition. Our Christmas Fayre will be held on Saturday 28 November, 9.30 - 11.30am. Come along for your coffee and mincepies. There will also be stalls, raffle and tombola. Joint Prayer Breakfasts are held on the second Saturday of the month in the Methodist Church Hall. Come along for your breakfast at 8.30am. The next one will be on Saturday 12 December. The Village Carol Service will be on Tuesday 15 December at 7.00pm in the Methodist Church. The service will include items by village organisations and Silver Sound Brass Band. Refreshments will be served after the service. We are hoping to have a coffee morning in February. Please look out for posters. May the congregation of the Metheringham Methodist Church wish you all a joyous Christmas and a peaceful 2010. Christmas Services at Metheringham Methodist Church. The Village Carol Service will be on Tuesday 15 December at 7.00pm in the Methodist Church. The Rev. Martin Avery will lead the service on Sunday 20 December at 10.30am. The Christmas Day Service is at 10.00am and led by Peter Baumber. Metheringham Feast saw the library staff dressing up again, this time as characters from the musical Mary Poppins. As the weather was showery at first, we had to have our books for sale displayed under the canopy and inside the porch instead of being able to spread them on tables outside of the library. Despite the lack of space we did get lots of customers and sold numerous books but we still have more for sale. If you want a bargain, adult fiction and all junior books are 10p each or fill a (supplied) bag for a £1. Adult non-fiction books are 60p each. A new computer course covering the Internet and e-mail started in September and we are now taking names for the next course in January 2010. Lincoln College have been running these courses at the library twice a year since 2000 and they are still proving very popular. It's encouraging that lots of older people are taking the plunge and becoming computer literate. The area above the children's corner, has been transformed by local Fairy Queen artist Lizzy Mason. She has made us a fantastic frieze with a woodland theme and incorporating several storybook characters. Lizzy lives in Metheringham and has a website where you can see examples of her work. Just search for Lizzy Mason, Metheringham or fairyqueenfairytime.com. She has also made a display for Branston Library and will be doing another one at Washingborough Library. 2009 was a transition season between moderate success in 2008 and hoped for success in 2010. As a number of players had left, two other players played only one game each, and another could not play at all, the club relied on some good young players. With experience and time, it is expected that they will be the equals of the players from the past. The club is delighted with the progress they made even during this one season, and the club is looking forward to seeing further advances next season. Each has made a significant contribution to the team at least once, and so the club can only hope for several such contributions in the forthcoming season! Naturally, as well, the club is very pleased at the efforts of the relatively few 'older' players who are still in the team. What happened was that the club lost all its league games during the season! They also lost one friendly but did end with a win in a second friendly, which was the final match of the season. Finally, this was the club's 20th year since it reformed and started to play friendlies in 1989. There are only two players left from that period: David Franklin and David Glew. They were given individual mementoes to commemorate their contribution to Nocton cricket over those years. Once again another season has passed and although the season started a little wet and cold it finished with fine sunshine. The Club took part in seven local leagues. The Sunday Morning EBA side came top. The City Evening League team moved back into the "A" Section while the Lincoln District League Premier side ended in third position and were also runners-up in the Hospital Cup. Our Lincoln League Division Three side finished in mid table and both our City Afternoon side and Cliff League team all had satisfying seasons. Of all our sides only the Friday EBA Fours didn't have too good a season so all in all it was a fairly pleasing season. At the recent AGM there was a complete change on the Executive front with the previous Chairman, Secretary and Treasurer all standing down and yours truly now the Secretary. We would like to express our sincere thanks for all that the out going members have done for the club. And Meow for Something Different. David Lockyer, who lives in Martin, has published a book of poems about cats called CATamorphosis... or changing into a cat. What follows is his account of how he came to write the book. "Who has not envied cats their lifestyle? I have been a cat slave from a young age and I have been writing for not much less. When I realised that I had written a number of cat poems it was only a gentle cat leap to produce a themed book dedicated to the mischievous darlings. My life has been enriched by five moggies: Mickey - who, despite the name, was female! ; Pushka - who lived to a crusty age; Ben - who tolerated being dressed up for many childhood 'plays'; Bonnie - who was as fearful and dependent as a cat should not be and Phoebe Macpherson - an almost mad feral kitten who was an ambushing Cato to Bonnie's Inspector Clouseau. The writing goes back a lot further than this, though. Continue reading And Meow for Something Different.. The Friends of Dunston School are a group of parents committed to working for the good of Dunston St. Peter's C of E Primary School. We consider all parents to be 'Friends' and everyone is welcome at our meetings and events. We organize a number of events throughout the year including Christmas and Summer Fayres, Treasure Hunts and family fun evenings. Our aims are two-fold; to raise money for the school, and to enrich the school community with light-hearted activities for all the family. In the academic year 2008/2009 we raised almost £2500 for the new school library. As this project is now complete we have asked the school to provide us with a wish list for 2009/2010. Surprisingly, the staff did not find this task too difficult. Consequently, we have a new fundraising target of approximately £3000 in order to purchase a PA system, an interactive whiteboard, 2 printers, dressing up outfits, construction kits and more! As a new initiative this year we will be organising some events in partnership with Digby C of E Primary School. As the two schools are now joined in a federation we are looking into new ways of working together, following the lead of the children and staff of the two schools. We are looking forward to an evening of magic to be held at Digby and a family barn dance in Dunston. Both events will take place in the new year. We recently held a successful Ladies shopping evening at Dunston school and would like to take this opportunity to thank the many stall holders who joined us, and the shoppers who came and supported our event. We raised approximately £240 and everyone had a good evening, with some people even getting a head start on their Christmas shopping. We would like to invite you to our Christmas Fayre on Friday 4th December from 3pm at Dunston School. There will be games and stalls for all ages so please join us and get into the festive spirit. Another successful year draws to a close, demonstrated by the increase in membership, now approximately 50. Wed 16 September was our open evening, Alan Halsam demonstrated his wood-turning skills. There was a stall with things he had made which we could purchase: bowls, vases, plates etc. Wed 21 September was a craft evening taken by some of our members. There were four activities to choose from - sewing bookmarks, making Christmas Crackers, painting Christmas Cards and folding fabric boxes. For those not feeling "crafty" there was a quiz. Wed 18 Nov we had a talk by Lesley Walker about Researching Family History. The year will conclude with the Christmas Social on 16 December. A theatre trip to Lincoln to see Fiddler on the Roof, a visit to the Kinema in the Wood at Woodhall to see the film Julie and Julia, and another Ten-pin bowling outing - always very popular. On Thursday 26 November we will be visiting Chatsworth House to experience some of their Christmas Activities. Our Tombola at the Fayre and Feast was a sell-out. The musical was Cats and to back-up the theme our stall was decorated with strings of (empty and clean) cat food packets and tins. Another sell-out was the table we had for the Table-Top sale on Sat 21 Nov.
To keep minds and muscles active two teams have been entered into the Darts League, one team into the Table Tennis League and two Quiz Teams to represent Metheringham WI in the Quiz Evenings. I am a keen but somewhat haphazard gardener and by December I feel I can safely shut the potting shed door without a guilty conscience until January. However, I can't sit round the fire planning my next year's floral and vegetable extravaganza as there is Christmas to look forward to. When the English speaking countries sit down to a "traditional Christmas dinner" we eat an Aztec bird by an Alsatian tree followed by a pudding spiced with sub-tropical fruits. One of our popular carols tells of the Bohemian King Wenceslas, set to the music of a Swedish spring song. This set me thinking of how other countries celebrate Christmas. The Danish Santa Claus Julemand (Yule man) has helpers called Julenisser who have been in Danish folklore and legend for centuries. Nisse (as he is known) wears home spun grey clothing and is said to live in barns and outbuildings. When we stayed with friends in Denmark they had a life size Nisse in their attic and. according to custom gave him a bowl of porridge on Christmas Eve. Woe betide them if they do not leave anything out for these little men who can be quite grumpy and might not leave presents. As the nights draw in the Danish family will make new decorations from brightly coloured paper. The tree is kept hidden in the main room and decorated in secret by the parents until it is shown in its full glory just before dinner on Christmas Eve. After dinner the tree is lit and the family walk round it singing Christmas hymns. Presents are then opened. Our outing to Brigg Garden Centre on 27 Oct went very well. We had a full bus, plus a car. Fifty two members sat down to lunch on arrival. This was followed by a couple of hours Xmas Shopping. Judging by the people who bought bulbs and pansies there was a lot of gardening going on in Metheringham that week. 17 Dec Invitation from Village Hall for coffee and mince pie followed by the Nativity Play,	once again presented by the Metheringham Pre-School Children. We have recently enjoyed the official opening of our new library. Sue Hampton, an up and coming author, did the honours. She has just written her fifth children's novel, a super book called "The Lincoln Imp". It was lovely to see so many children, parents, grandparents, governors and representatives of the builders, designers, the Diocese, Lincolnshire County Council and many more there. We are using the new room in a variety of ways. We now have a Breakfast Club which is thriving. We have music lessons in there, clubs, meetings, group teaching as well as the main function of a library. I would like to say a big well done to everyone who helped make the Scarecrow Weekend such a huge success once again. The atmosphere was wonderful and all of the visitors whom I met were friendly, happy and appreciative of all the hard work that went in to creating the excellent displays. The annual car wash was a huge success again this year with a fantastic response from the community who brought along their cars for a clean and to support the Fire Services Charity. We would like to thank everyone who supported us on the day and without you we would not have achieved the £424.00 raised on the day, Thank you. The station attended the village Fayre and Feast on 24 October along with other representatives from Lincolnshire Fire & Rescue which included the "Community Fire Safety Team", members from the"Recruitment Team" and a front line water rescue appliance from Lincoln North. The other main attraction was the vintage fire appliance which attracted a lot of interest from young and old. A big thanks to John Betts who had the gruelling task of bringing and returning the appliance from Louth Fire station where it is housed. The appliance is self funding and relies on dedicated volunteers and donations to run and maintain it. Any donations would be welcome, which we will be pleased to pass onto John. The station wishes to pass on their thanks to Fire Fighter Arthur Basker-Hugil (Art) who has recently left the service after serving twelve years as a fire fighter at Metheringham. Art joined the fire service in 1997 and was a dedicated crew member at the station, attending many and varied types of incidents. We wish Art all the best and I say a big thank you to him and his family, Nicola, Daniel and Megan. If you like to serve the community and do something worth while why not join the Fire Service as a retained fire fighter? If you would like any further information please contact Roy Darwood on 01526 321489 or call into the station on a Monday evening between 7.00pm and 9.00pm. Arrangements are being made with Santa again this year who will, we hope, be visiting Metheringham during December. Further information to follow. Please make sure that you check your smoke detectors regularly and if you are planning to use Christmas lighting decorations make sure they are thoroughly checked and that you do not overload electrical sockets . If you have any queries or concerns please contact Duncan Cook on 01526 321330. We are coming to the end of our year of events to celebrate 150 years. Our recent events have included a celebration lunch club which was well attended and enjoyed by all and First Aid training for families which was not so popular . On the subject of food, the pudding party has been postponed and will now be held some time during 2010 - watch this space for details! Christmas will see our usual midnight service with carols and candles - starting at 11.30 pm. In preparation for the scarecrow festival we took off the front gates to make more room. If anyone can help us to sell these we would be most grateful - they are very solid and very heavy. Shooting Stars is continuing to go from strength to strength and some of the girls took park in an open competition in Wakefield at the beginning of September. The girls who entered the competition did very well, coming away with a clutch of medals. Jasmin Lawson won 1st place in Tiny Baton Solo, as well as 1st place with Jaden Gray in Tiny Flag Duo. The two also achieved 3rd place in Tiny Baton Duo. Jasmin also won 2nd place in the Tiny Marching competition. Lieouni Gray came 4th in Juvenile Baton Solo and 2nd place in Juvenile Marching Comp. Lauren Taylor-Raymond came 2nd in Junior Baton Solo, 1st in Junior Mace Solo and 1st in the Junior Marching comp as well as 1st Place in Junior Pom Duo with Lieouni Gray and 1st Place in Junior Flag with Katie Starbuck and finally 2nd Place in Junior Baton Duo with Lieouni Gray. - So a big well done to all the girls who entered. The rest of the team attended the Gypsey Bridge Fete on the 20th September. The weather was kind and the girls put on a great display so well done to all of you. We are now preparing for our Christmas show and some of the girls will be starting new routines ready for a regional competition in March. We are holding a Christmas Fayre at Martin Village Hall on 12 December from 2pm - 4pm, so come along and support the team. Should you wish to join the team or book us for an event, then please contact me. Wishing you all a happy and healthy festive season. Cathy & all at Shooting Stars. Hello from your local beat-team. It's hard to believe that I am writing an article for the Winter issue of MACLA already. This year has absolutely flown by. Your area continues to be a safe and pleasant place to live, with a very low crime-rate. I am very pleased to say that the recent 'trick or treat' night caused no problems at all, with no reports of egg or flour-throwing, doorbell-ringing, or similar 'pranks'. Thank you to all our retail outlets, who assisted us by refusing to sell eggs or flour to children. Bonfire-night has also passed without any reports of firework-throwing, bangers being put through letter-boxes, or similar mischief. With the exception of the odd incident, our youngsters have been pretty well behaved recently, and I feel that our 'zero-tolerance' policy of confiscating all alcohol from under-age drinkers is having the desired effect. Continue reading Police News Winter 2009. I loved it and found it every bit as good as her previous book, The Island. The description was brilliant and it was easy to find yourself right inside the scenes. Historically it was quite frightening. I knew the Spanish Civil War was quite brutal but this showed how it was violence for violence's sake and made me realise that it was a sort of rehearsal for the Second World War and the death camps. I gave it full marks for both the enjoyment and quality of the writing. The gist of the story as explained on the back of the book - Beneath the majestic towers of the Alhambra, Granada's cobbled streets resonate with music and secrets. Sonia Cameron knows nothing of the city's shocking past; she is here to dance. But in a quiet café, a chance conversation and an intriguing collection of old photographs draw her into the extraordinary tale of Spain's devastating civil war. Seventy years earlier, the café is home to the close-knit Ramírez family. In 1936, an army coup led by Franco shatters the country's fragile peace, and in the heart of Granada the family witnesses the worst atrocities of conflict. Divided bypolitics and tragedy, everyone must take a side, fighting a personal battle as Spain rips itself apart. When an old man died in the geriatric ward of a nursing home in New South Wales, Australia , it was believed that he had nothing left of any value. Later, when the nurses were going through his meagre possessions, they found this poem. Its quality and content so impressed the staff that copies were made and distributed to every nurse in the hospital. One nurse took her copy to Melbourne. The old man's sole bequest to posterity has since appeared in magazines around the country and in a magazine on Mental Health. A slide presentation has also been made based on his simple, but eloquent, poem. Continue reading Food for Thought. To any Lincolnshire Echo readers and anyone who gave me information or publicised items in the village notice board over the summer and wondered why they weren't "in the Echo". Several Echo readers commented to me in September that there had been nothing in the Grapevine over the summer. I thought this odd as I have been submitting pieces regularly and had not received any messages from the Grapevine editor to say there was a problem. Consequently I tried to e-mail him directly but got no response. I have now discovered by telephoning the paper that the Grapevine editor I have always dealt with left at the end of May and no-one thought to let me know or divert his e-mails. I have put in a complaint on your behalf as I think this shows incredibly bad internal and external communications and bad management. It has broken the trust between the organisers of events and me and me and the paper and may well have influenced the profitability of fundraising events over the summer months. I am now in contact with the new editors of the Grapevine and will hope to see things improve but they do tell me that space is very limited. I have also now received a letter of apology from the Editor to the village groups citing redundancies and office re-organisation as an excuse. I think maybe the time has come to look at expanding into other forms of communication -websites and the like - and I may well stop contributing to the Echo if there are any more problems. The Sleaford Standard are still doing their best to support Metheringham's events and groups. I apologise for not doing something sooner and hope that poor support for this summer's events has not been due to lack of exposure in the papers. If anyone else would like to take over the job of correspondent it is still up for grabs but I am happy to carry on trying to represent you until then! The Star and Garter Vegetable and Produce Show 2009 produced its best ever result on Monday 7 September with £775 being presented to the St Wilfrid P.C.C. for a new lawnmower and gardening equipment for the cemetery upkeep. Regular entrants and the organisers were delighted that Mo Mitchell won the Best Onion class. Gandy Gray won the best marrow and the largest onion and the best tray of vegetables. Janet Wood got first and second in the Jam class and Sam and Katy Flintham ruled the Children's Novelty Vegetable class. Children's Novelty cake was won by Rosie Searle and Declan Hastie won best Children's Recycled Model. In the cookery classes the best fruitcake and the best sponge cake were both won by Jean Blundell and Christine Whitfield won the best pastries. Following the sumptuous buffet lunch there was a very successful raffle and auction with the highlight being £30 bid for the Mystery box. Thanks once again go to the judges, District Councillor Bill Chambers and Mrs Molly Chambers and to the wonderful hosts Butch and Maggie and their team. Continue reading Star & Garter Vegetable & Produce Show - 07 September 2009. It has been a difficult season for the Sunday XI side that finished rooted to the bottom of a very strong premier division. Other teams in this division contained many ECB players, we also faced Lincolnshire's opening bowler and two others that are being watched by 1st class county sides. We were not helped when we lost our captain three days before the season began, leaving us in turmoil to say the least. Phil Woodcock stepped in for the first game before James Ingamells stepped forward and ran the team very well with limited resources for the rest of the season. To be honest there were few highlights and we only managed one victory throughout the season. Continue reading Blankney Cricket Club 2009 Review. Metheringham Animal Welfare Supporters group have just held their Christmas Market in the village hall on Saturday 14 November. What a day it was too! Full and busy from the word "go" as the volunteers dashed about getting everything ready for the stall-holders and then dressing their own MAWS stalls ready for the 10.00 am start. Some of the "gang" even managed to get a bite to eat and a cuppa from the Snack Bar, before the mad rush of customersarrived. There were over 60 raffle prizes, 400 tombola prizes, the MAWS snack bar with good home cooking and a variety of gift and craft stalls to choose from, something for everyone. You could even have a Tarot card reading. For four of the volunteers it was their first market with us. They underwent the baptism of fire very well even if (as one of them said) they found it a bit disorganized and confusing for a start. We do hope that everyone enjoyed the day and although very tired, felt it was worthwhile to help raise funds for the animals. As we go to press, all the cash and bills are not yet in but we expect to have grossed just over £1,000 (about £800 profit - we hope!). A huge "thank you" to all who donated prizes, cakes, cards, blankets and cash, etc. Thank you for the hard work of the volunteers and stallholders and a special thank you to you the public for buying so generously, especially in these hard times, when money is tight. Bless you all. 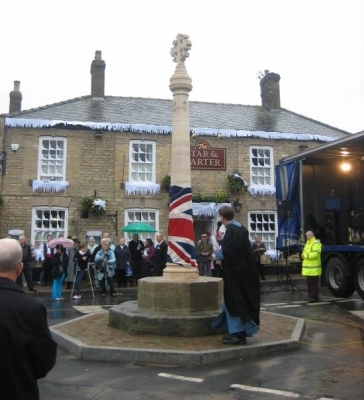 A new village cross, "a symbol of community and focus", was unveiled at the Metheringham Fayre and Feast on Saturday 24th October 2009. There has been a cross on the site since before the 14th century and the 2009 one was commissioned to replace the rather ineffectual 1949 version which was used as a stand in after the 1911 cross was damaged during the Second World War. With the recent Village regeneration project came the opportunity to put back a new cross in the style of the 1838 cross. 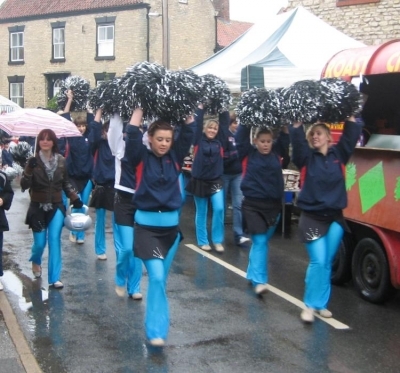 Although the setting up the stalls on the High Street was hindered by the rain the marching Starlite Twirlers led the parade to the village centre on time. The Venerable Tim Barker, Archdeacon of Lincoln, was escorted by a small group of Scouts and followed by the special guests from Lincolnshire County Council and North Kesteven District Council and including Mr and Mrs Peter Brown, from the Star and Garter to the cross. Dr Mike Allen, Chairman of Metheringham Parish Council, welcomed everyone to the village to witness the dedication of Metheringham's new cross and to enjoy the Fayre and Feast. The Archdeacon unveiled the Union Flag from around the Cross and then dedicated it as " a symbol of community and focus for all who live in Metheringham and all who come to visit Metheringham" and led a short prayer of dedication before declaring the Feast open. The first few hours were marred slightly by rain but the late afternoon and evening brightened up and visitors and locals were able to enjoy the stalls, appreciate the decorations, meet up with friends and family and enjoy the music. The theme of The Musicals brought a lively feel to the stalls and activities along the High Street. This year's competition was judged by Councillor Mrs Marion Brighton OBE. The winners of the best decorated Business Premises was Karen's Kuts' interpretation of the Phantom of the Opera. The best decorated stall was judged to be Metheringham Football Club's "Oliver" which was serving mulled wine in place of gruel and had plenty of lost boys coming back for more! The judges were especially impressed by the Methodist Chapel's interpretations of the Musicals in flower arrangements, particularly the Carousel but sadly they were not eligible for a prize. As well as the 62 stalls on the High Street and the 16 craft and display stalls in the village hall there were refreshments and goods available at St Wilfrid's Church, the Methodist Chapel, the village pubs and the other businesses along the street. Several had entered into the occasion with visitors greeted by the Lion from the Wizard of Oz at the Beehive, Mother Christmases at the Star and Garter's White Christmas, the cast of Grease in the Co-Op and the "Wicked" witches at Andrews Butchers' cauldron. Also cruising the streets were the Earthbound Misfits using some very flexible moves to duck the bunting across the street. The afternoon entertainment began with a display by the Starlite Twirlers, the Metheringham area's original majorettes, who had girls of all ages from babies to seniors displaying their baton and pom pom routines. The Silver Sounds Band based in Dunston had to switch venues to the Village Hall because of the weather but provided the visitors and stallholders there with a much appreciated performance, Ralph Curry and Billy Jay took to the stage with very different singing styles and the MAD singers performed a range of songs from the musicals during their two slots. Around 7.30p.m. there was a loud cheer as Metheringham's rock band, the Snogs, opened their set to play out the night with cover versions from the 1970s to the present day. As usual the only complaint was with the name. An extensive funfair operated throughout the day thanks to the travelling showmen who come to the Star and Garter field and car park every year. There had been some trouble with youths fighting on Friday night but thanks to extra police on duty around the area throughout the day the masses of young people who came in from surrounding towns and villages were able to enjoy themselves without any trouble. Councillor Fred Ambridge the chairman of North Kesteven District Council revealed that Metheringham Parish Council has, after several years of hard work, achieved Quality Council Status. Cllr Ambridge was congratulating the parish council on another splendid Fayre and Feast. In his response Dr Mike Allen thanked everyone involved including Mike Credland who has been event organiser for most of the event's 21 years and was instrumental in it's revival although there has been an annual feast in the village to celebrate the end of harvest since medieval times. This page is a archive of recent entries in the 37. Winter 2009 category. 36. Autumn 2009 is the previous category. 38. Spring 2010 is the next category.